One of my birthday presents this year was a gift card to Amazon from Aunt Marsha & Uncle Larry. Yay! That’s like a gift card to the world! I’ve been wanting a complete set of makeup brushes for a long time. Well, forever since I’ve never had one complete set. I thought I was going to get a set from Sephora but then I looked on Amazon for brushes when I received the gift card. I found this set from LA Minerals. Disregard the photo that looks like it was taken in 1987. 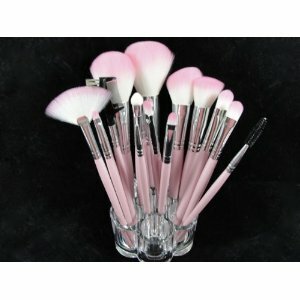 The brush set arrived and they are so pink and pretty! And SOFT like you wouldn’t believe! They haven’t shed either which is fabulous. I love them so much. I looove makeup and putting it on and now that I have a nice brush set I just feel more grown up.